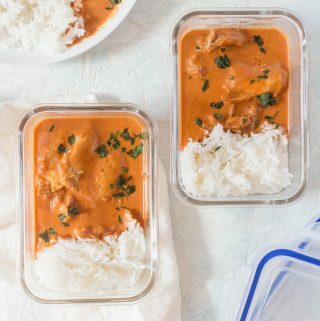 This dump and go Instant Pot Chicken Tikka Masala will knock your socks off! I am obsessed with how good this recipe is! 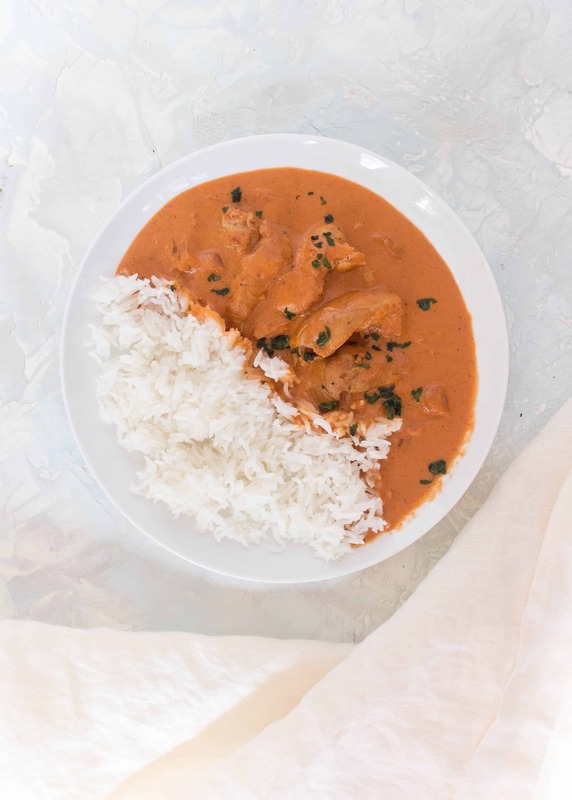 This Chicken Tikka Masala is so creamy and delicious, you’re going to want to drink up every last drop of sauce. I am so excited to share this delicious recipe with you. 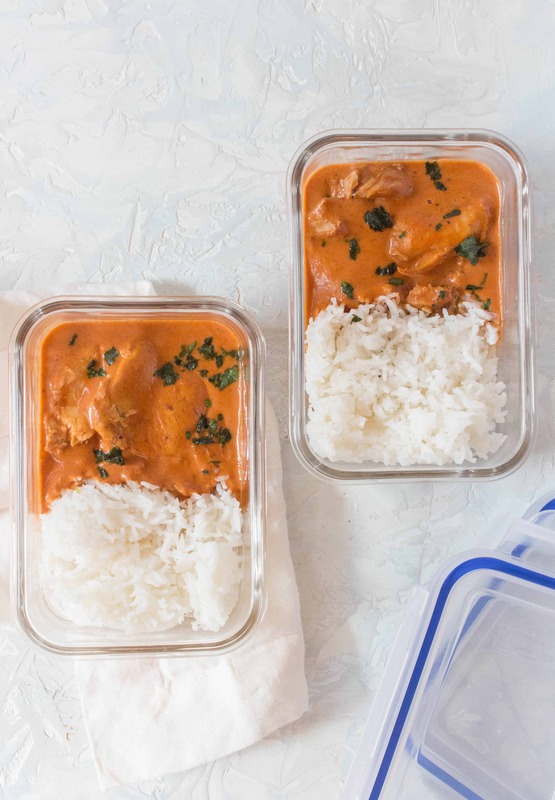 Ever since I had chicken tikka masala take out, I’ve been wanting to make my own at home. However, with marinating time and cook time on the stovetop, it can take quite a while to make it. Ever since owning the Instant Pot, I just want to do a toss and go kinda thing since it means I can do other things while the meal is cooking. 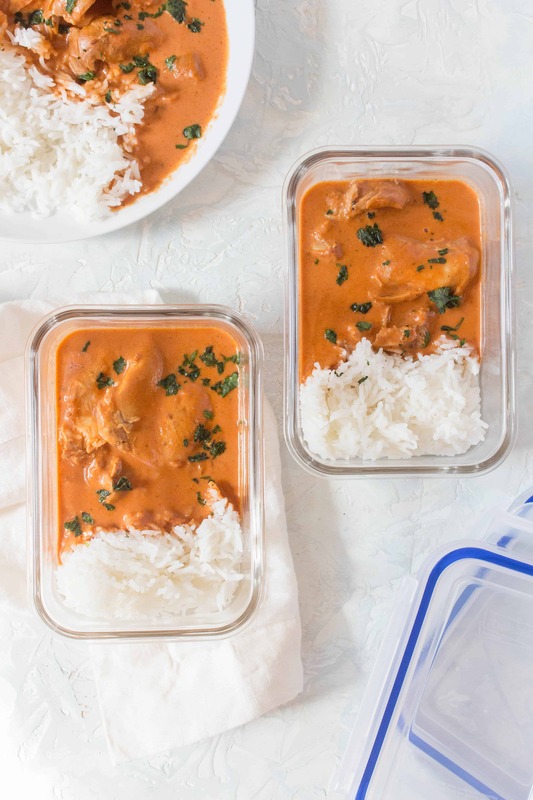 Even better is that this Instant Pot Chicken Tikka Masala is a dump and go styled recipe. There is no sautéing, no browning, just put everything in (layered of course), and then pressure cook! Okay, maybe there’s a little stirring involved since the coconut milk goes in last. But other than that, this recipe is easy as pie. Bonus, this makes for a delicious meal prep as well! In your Instant Pot, put your ingredients in a layer in this order: onion, garlic, chicken, seasonings (paprika, cinnamon, turmeric, garama masala), passata, pinch of salt. Close your Instant Pot, sealing the lid, and set it on manual pressure for 15 minutes. Once done, quick release the pressure and then stir in the coconut milk. If you would like a thicker sauce, you can simmer the sauce on low heat on sauté mode. You may notice that there isn’t the typical 1 cup of liquid in this recipe. Shocking, I know, but hear me out! The reason I specified the layering is because the onions on the bottom because 1. it helps prevent burning from happening and 2. the onion releases enough water when paired with the strained tomatoes. I use boneless skinless chicken breasts for this recipe, you can swap it for chicken breasts but the time will have to be adjusted. This recipe has only been tested in the Instant Pot Duo 9 in 1 in the 6 qt. 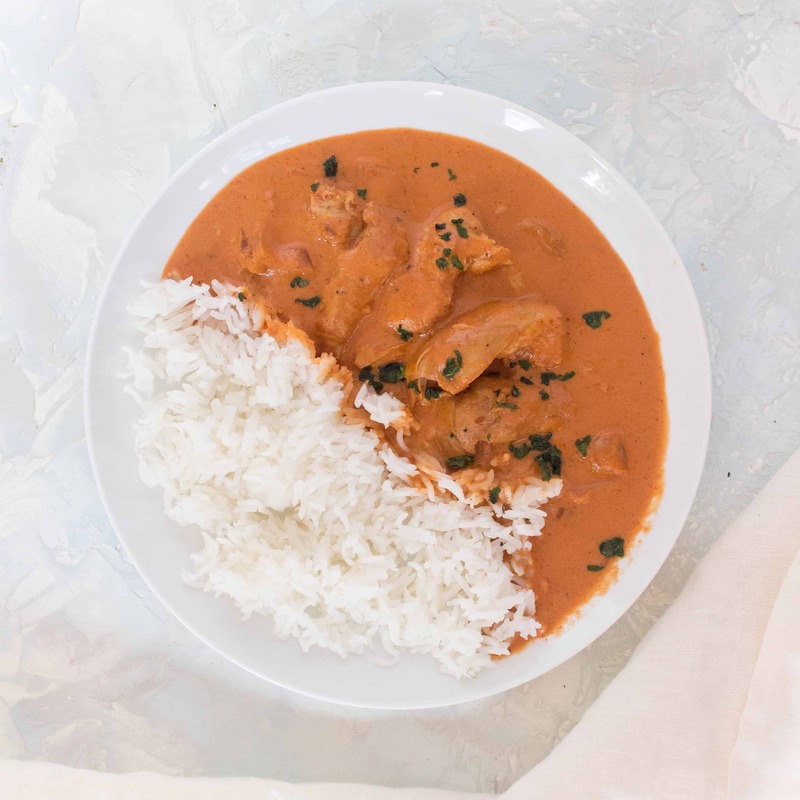 If you want a less saucy chicken tikka masala, half the amount of coconut milk. I love to drench my rice with the sauce so I love having extra sauce to use. Authentic/Traditional Chicken Tikka Masala is usually made with chicken that’s marinated in yogurt, then skewered and chargrilled but this is my lazy easy homemade version so I skipped that to cut down on time. Yogurt is used to tenderize the chicken so if you’d like to do a yogurt marinade, that’s up to you! 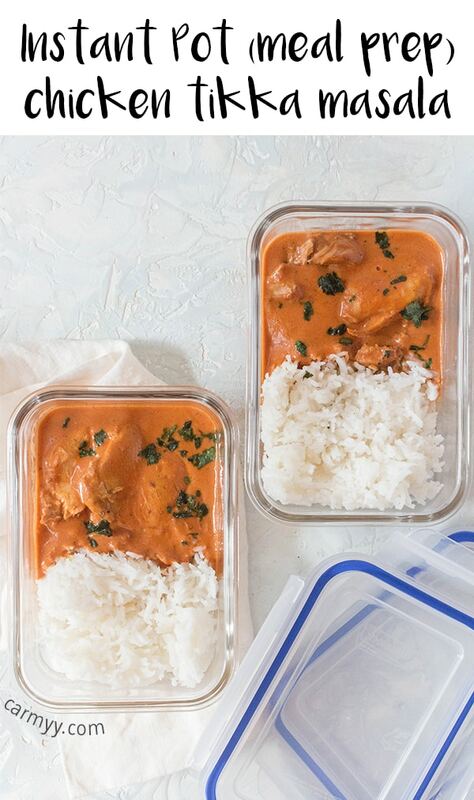 I use these airtight container to store the chicken tikka masala when meal prepping. Feel free to shred up the chicken or remove it to cut into chunks before putting the coconut milk in. 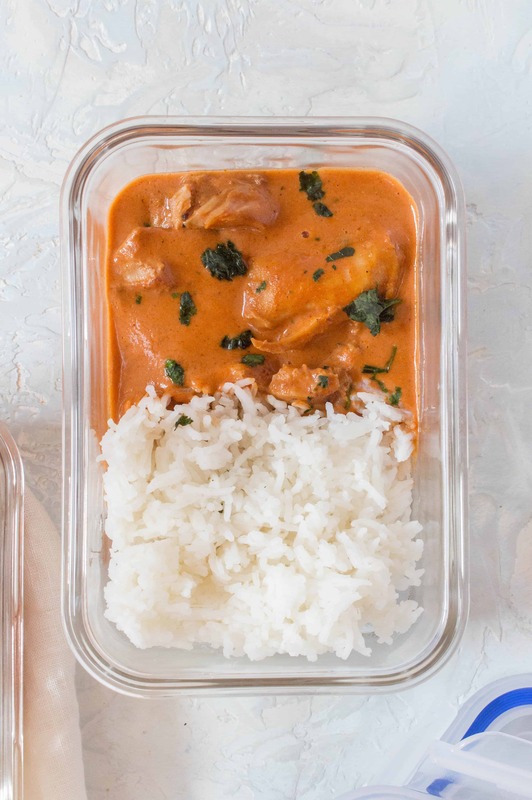 I am obsessed with how good this is, this dump and go Instant Pot Chicken Tikka Masala will knock your socks off! This recipe is so creamy and delicious, you’re going to want to drink it up. Burned before the instant pot even pressurized. Fail. I’m sorry to hear. Do you mind sharing what sized pot you are using and what sized onions you put in? Also, did you substitute the passaata or use a different brand? Made this last night after seeing it on Saturday. It came so good! I had thought the coconut would be too strong but it was perfect. Thanks! I’m going to try to double this next time. I used an 8-qt. Instant Pot, and and sliced the onions about 1/4′ thick. I could not find passata, so i used tomato puree. Hi Ari, as this recipe was written for the 6 qt, you would have to add more onions to make sure there’s enough to cover the bottom. Also, unfortunately, tomato puree is thicker than passata which would have contributed to your burn message. Hope this helps! If I make w/ boneless chicken breasts, how long do I cook for? First time using instant pot! Hi Marit! For boneless chicken breasts, cook at 6 mins per pound! This was so easy, and delicious! !